While cheerleading once involved just leading cheers and chants with minimal tumbling and acrobatics, modern cheerleading has greatly evolved. It is much more competitive and involves a highly athletic mix of dance and gymnastic skills, as well as complex stunt and pyramid maneuvers. With these advances, the potential for severe injury has increased. Cheerleading accounts for more than 16,000 emergency room visits annually in the U.S. and more than half of the catastrophic injuries in female athletes. Cheerleading injuries are more likely to occur in practices and tend to involve the entire body — most commonly the ankle, wrist, shoulders, head, and neck. In order to minimize the risk of catastrophic injury, restrictions have been placed on stunts. Mandates include limiting the height of human pyramid stunts, limiting the height in which a cheerleader may be thrown into the air for a basket toss, and a requirement for having a certain number of spotters on the ground during these acrobatics. Mats should be used during practice sessions and as much as possible during competitions. Stunts should not be attempted without proper training, and not until the cheerleader is confident and comfortable with performing the stunt. Concussions are another potential injury in cheerleading. A concussion is an injury to the brain resulting from an impact to the head. 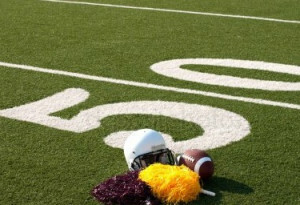 Concussions are a risk for any athlete, but are a particular concern for those participating in cheerleading due to the nature of the activity involving height, inversion, and rotation of the body as well as physical interaction and contact with other team members. Players and coaches need to be mindful of any symptoms that arise after a fall, including headache, dizziness, or nausea. As with any activity in which their child participates, parents have a role to play in ensuring that their child is able to reap the benefits that come with the activity while being protected from unreasonable risk. If a parent has a concern about safety, they should bring it to the attention of the coach. If a satisfactory response is not received, they should contact the administration to make sure proper procedures are in place for safety. Cheerleading has become a sport that places significant demands on the body and can result in severe injuries. Proper attention to safety and preparation can help minimize injury risk.